The peaceful appearance of the phemba (or pfemba) maternity figures of the Yombe, an ethnic group spread across the Democratic Republic of Congo (DRC), the Congo, and the Angolan territory of Cabinda, belies the fact that they raise many questions. These statuettes have always attracted collectors by virtue of their universal and easily recognizable theme of the mother and child, which evokes tenderness and serenity in the viewer. Their smooth and naturalistic appearance, and their nature as exotic African objects (although this is relatively low key) have also made them desirable. 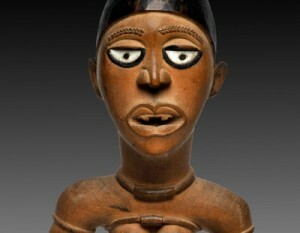 The first two of these characteristics, which also occur in European art, have made many researchers and authors attribute European influence to phemba figures. The stakes are high in this debate and pertain not only to the question of stylistic influences but also involve the delicate question of the appropriation of masterpieces of African art by European traditions. Text: Phemba: Mother and Child among the Yombe. In: Tribal Art (printemps 2010). 112-117. 2010.